Whether your wisdom tooth makes you wise or not is a separate matter for debate but your wisdom tooth gives you intense pain for sure! Your mouth can have four wisdom teeth, medically called molars, one at each corner. Your wisdom tooth or teeth may grow when you are anywhere between 16 and 25, and sometimes even later in life, in your 30s too. If you go by popular belief, this is the age when you gain worldly wisdom and hence the name wisdom tooth. If you are lucky enough to have a big mouth, you may not get pain while your wisdom tooth grows in there. The problem arises when there is not sufficient room in your mouth for further teeth. But, the wisdom tooth, in its desperate attempt to appear may start pushing your other teeth or stuck against them. It then grows at an uncomfortable angle under your gum, which is then called impacted wisdom tooth. This impacted wisdom tooth is what gives you pain, swelling and irritation. Bacteria may also grow around this impacted wisdom tooth and increase your pain and problems. What’s more irritating is that wisdom tooth pain, most of the time, occurs at night when you are fast asleep and suddenly you wake up due to throbbing unbearable pain in the mouth. No dentist will be available at these wee hours and what comes to your help are the home remedies for wisdom tooth pain relief! When there were no commercially available anesthetics like Benzocaine, dentists used clove oil or clove gel for numbing the pain from wisdom tooth growth. Clove (Eugenia aromaticum), has anesthetic, antiseptic, analgesic and antibacterial properties, perfect for giving relief from horrible toothaches. All the properties of clove are due to its natural component eugenol. Eugenol is the active ingredient in most of the modern dental medicines too. Why not then use comparatively cheaper and easily available cloves or clove oil for wisdom tooth pain relief! Take 1-3 whole cloves and hold them in your mouth close to your aching area. Within a couple of minutes, the cloves will release their essential oil into your mouth. You will feel the area with clove going numb. As the whole spice becomes softer chew it slowly to get even more eugenol from it. Take few drops of clove essential oil and with the help of a cotton ball, hold it gently but firmly against you aching wisdom tooth. You may also apply this oil using your clean fingertip. If you feel, clove oil is too strong for your mouth, dilute it in ½ tsp of olive oil and then apply it to your aching tooth. You may also use ground clove powder to get relief from pain due to wisdom tooth. Just apply a pinch of clove powder where it pains in your mouth and waits for it to get dissolved. Precaution: Although there may occur a little burning sensation on applying clove oil into your mouth, if this sensation is in intense or at a level where you can’t tolerate it, you may be allergic to eugenol. In such a case, immediately rinse your mouth with water, a lot of water. Stop using clove or clove oil and use some other home remedy for wisdom toothache or see your doctor. Also, while clove oil is considered safe when used in small quantities, it may cause liver and respiratory problems if you ingest this oil in large quantities. If onion can relieve inflammation and joint pains due to arthritis, it can also be helpful in relieving swelling and pain due to a toothache. Onions have phytochemicals such as disulfides, trisulfides, cepaene, and vinyl dithiins, that have anticancer and antimicrobial properties and thus can kill the germs causing infection in your mouth and give you relief from pain. The more pungent an onion is, more effective it will be. Shallots, yellow and red onions are more effective than the white and sweet onions when it comes to pain relief and other disease-fighting qualities. How to Use Onion for Wisdom Tooth Pain Relief? Just as you get the feel of a toothache, take a slice of raw onion and chew it, spreading its juice to where it aches. If your pain is so much that you can’t chew the slice of onion, hold it gently but firmly against your aching mouth area. You may also experiment with onion juice. Crush and extract the juice of onion and apply it to your wisdom tooth. With its nutrient-rich composition due to various minerals and vitamins, asafetida has long been used by Ayurveda to cure a variety of diseases and medical conditions including toothaches. Asafetida is a resinous gum having a pungent smell and is commonly used as a flavoring agent in cooking all over the Indian subcontinent and Central Asian region. This resin, among other natural chemicals, contains asaresinotennol, free or combined with ferulic acid and umbelliferone. Ferulic acid has anti-inflammatory, antibacterial and antispasmodic properties while umbelliferone is antiseptic. All these constituents of asafetida make it a good remedy for toothaches, including wisdom tooth pain. How to Use Asafetida for Wisdom Tooth Pain Relief? • Crush the asafetida in lemon juice with the help of pestle. • Now slightly heat this mixture. It just needs to be lukewarm. • Take a cotton ball and soak it in this lemon-asafetida warm solution. • Place this compress against your aching wisdom tooth. • You may instantly feel the relief you get from the pain. If your guava fruit has come with leaves, do not throw them away. Yes, guava leaves are excellent pain relievers. Guava leaves have a bioflavinoid, Quercetin, which has anti-spasm properties. The high content of Quercetin in guava leaves lends them the excellent pain killing properties. These leaves have many properties that include astringent, antibacterial, pain blocking, and disinfecting qualities. They can also cure bleeding gums bad breath. One of the ways is as simple as chewing guava leaves. Take 1-2 tender leaves of guava and chew them slowly to release juice into your mouth. You also boil 4-6 guava leaves in a glass of water for about 5 minutes. Then let the solution cool down a little. Once the liquid is tolerably warm, you may strain the liquid and use it as the mouthwash. To make it more effective, mix half to one tsp of salt to this guava leaves decoction. Wheatgrass is made from the cotyledons of the common wheat plant. A cotyledon is one of the important parts of the embryo within the seed of a plant. Juice made from this wheatgrass is a rich source of chlorophyll, antioxidants, vitamins and minerals. Chlorophyll is an excellent anti-bacterial which inhibits the growth of bacteria. It has the capacity to neutralize toxins in your body. It is also a fine antiseptic and anti-inflammatory agent. Only a little amount of wheatgrass juice is what is required to prevent tooth decay! With all its benefits, wheatgrass juice is one of the best remedies for tooth pain including that which is due to wisdom tooth. How to Use Wheatgrass Juice for Wisdom Tooth Pain Relief? Fill your mouth with wheatgrass juice and hold it for about 5 minutes. Now throw this away. This is said to pull out all toxins, bacteria from your mouth. You may also want to show some wheatgrass and then throw it away. Garlic has antioxidant and anti-inflammatory properties that can go a long way in relieving pain. Thiacremonone is one of the sulfur compounds present in garlic. It inhibits inflammatory responses in a body which may be helpful in treating inflammatory diseases. Antioxidants present in garlic also helps reduce swelling and in turn giving relief from pain. Take a garlic clove and crush it a little so that it may release its juice. Now hold this crushed garlic clove against your aching wisdom tooth. Crush 1-2 garlic cloves to get a paste. Add some salt, preferably black salt to this and apply on your aching area in the mouth. Cabbage has been used since ancient times to treat wounds and swellings. Cabbage has excellent anti-inflammatory properties and its juice is a rich source of lactic acid. Lactic acid is a powerful anti-bacterial. It can, thus, be used to relieve pain and swelling associated with toothache, even when it is due to a growth of your wisdom tooth. How to Use Cabbage Leaf for Wisdom Tooth Pain Relief? Using a rolling pin, roll over the leaf to soften it. Now take out its veins. Roll it up and insert it between your aching tooth and the gum. Vanilla extract that you use for cooking and baking can come to your help when you need that much-wanted relief from pain due to wisdom tooth. Vanilla extract is derived from the vanilla beans by brewing them with alcohol and water. It is rich in antioxidants and because it also has little concentration of alcohol, it is capable of numbing the gums around your painful tooth giving you relief. Vanilla essence, however, is not same as vanilla extract. Vanilla essence is made by combining chemicals whereas vanilla extract is derived from the original vanilla plants. If you use vanilla essence instead of extract, you may not get the same effect on your painful wisdom tooth. How to Use Vanilla Extract for Wisdom Tooth Pain Relief? Take some vanilla extract on your fingertip and rub it on your painful tooth and gum. Take a cotton ball and soak it in vanilla extract. Rub or dab around the painful area with this cotton ball. You may also leave the cotton ball there for a few minutes. The strong aromatic herb peppermint is one of the oldest remedies for a toothache, just like clove. Peppermint is anti-bacterial, anti-viral and has mild anesthetic properties too. You may use peppermint tea or peppermint oil to get relief from your wisdom tooth pain. Take some peppermint oil on fingertips and rub the painful mouth area with this. Remember not to ingest it. You may also use a cotton ball to apply peppermint oil on your painful wisdom tooth. Take 1 tsp of dried peppermint leaves. Pour one cup of hot water over it. Let it steep for about 20 minutes during which it will cool down. If it’s lukewarm, it’s better but if it’s at normal temperature, that will also do. Take a mouthful of this peppermint tea and swish this around within your mouth. Then repeat this until your tea gets over. tea tree leaves as well as oil had been used by the Aborigines to cure various infections due to its antibacterial, antiviral, and antifungal properties. This essential oil also has a mild anesthetic effect. Which can numb your aching area. 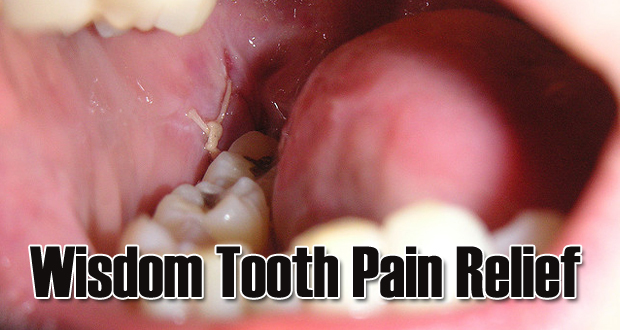 How to Use Tea Tree Oil for Wisdom Tooth Pain Relief? Take 1-2 drops of tea tree oil and rub it on your tooth with fingertips. If it feels very strong, dilute it with a little olive oil. You may use ½ tsp olive oil and mix 1-2 drops of tea tree oil with this. Now apply on your painful tooth with fingertips or a cotton ball. Precaution: Do not swallow tea tree oil. If you feel any kind of irritation or discomfort similar to an allergic reaction, rinse your mouth with water and see your doctor. Oregano herb is rich in a number of minerals like calcium, magnesium, zinc, iron, potassium, copper, boron, and manganese and vitamins C, A and niacin. Oregano oil has the components carvacrol and thymol that give this oil its strong antiseptic properties. This oil is a powerful natural painkiller and can be of utmost help in relieving pain due to the wisdom tooth. You need to use a very small amount of diluted oregano oil for a toothache as it is very strong. How to Use Oregano Oil for Wisdom Tooth Pain Relief? Take 1 drop of oregano oil and dilute it with 1 tsp of extra virgin olive oil. Rub this oil mixture on your painful tooth and gum with fingertips. The nerve soothing lavender oil has anti-inflammatory and antiseptic properties that may get you rid of tooth pain. In fact, some aromatherapists use this oil to ease anxiety related to dental procedures. How to Use Lavender Oil for Wisdom Tooth Pain Relief? You can directly apply some oil on your painful tooth and rub with fingertips. You may also soak a cotton pad with this oil and place it on the aching tooth. The ancient Greek soldiers had myrrh as an essential part of their combat gear just due to the excellent antiseptic and anti-inflammatory properties of myrrh gum resins. The fine natural antibiotic and disinfecting agent, myrrh, can come to your rescue when you suffer from a wisdom toothache. • Use myrrh oil as mouthwash. • Add two drops of myrrh oil to a cup of water. • Rinse your mouth with this. • To make it more effective, add two drops of clove oil and 1 drop of lavender oil too. • You can also use myrrh powder. • Take 1 tsp of powdered myrrh. • Mix it with 2 cups of water. • Let it simmer for half an hour. • Strain and allow it to cool down. • Now take 1 tsp from this solution and mix it with half cup of water. • Rinse your mouth with this water. • Repeat 5-6 times a day. If you have only mild pain in your wisdom tooth, you may well think of using ginger as its remedy. The anti-bacterial properties of ginger root can get you rid of minor toothache as well as minor infection and swelling related to wisdom tooth. How to Use Ginger for Wisdom Tooth Pain Relief? Wash and peel a ½ inch piece of fresh ginger root. Place this piece between your aching teeth. Now slowly bite it with the tooth that has pain. This will release the juice from the ginger. Swish the juice around the painful area. Continue doing this for 3-5 minutes. During this time, ginger will soften enough to be chewed. Chew it properly and swallow or spit the remains. If your tooth hurts while biting the ginger piece, you can even make a ginger tea to be used as mouthwash. Place ginger slices in a mug or pot. Pour 1-2 cups of boiling water over this. Let it steep for about 20 minutes. It will coll down to be just warm. Sip the tea and swish it around your mouth. Swallow or spit. Then take another sip and do the same procedure- swish and swallow or spit. Repeat till your ginger tea finishes. This is again a herbal remedy for toothache. Sage herb has antibiotic and anti-inflammatory properties and can not only cure toothache but also gingivitis, mouth sores and bleeding gums. When using for tooth pain, it is used with alcohol and salt. Alcohol also contribute in numbing the area and giving instant relief from tooth ache. How to Use Sage for Wisdom Tooth Pain Relief? • Crush the sage and place it in a shot glass or any other small glass. • Add salt to this. • Let it infuse for about 5 minutes. It will become greenish brown. • Now take a sip along with the herb. Do not swallow. • Spit and take another sip. Repeat like this until your tooth pain subsides. Some of the above home remedies for wisdom tooth pain relief will work for all but some others may or may not be effective depending upon the response of your body to these home remedies. Hope the first remedy that you try becomes the best home remedy for your toothache.